Cut the salmon into 5mm thick rectangular slices. For the dressing, whisk all the ingredients together in a small bowl. Cook the soba noodles as per the packet instructions, drain and cool under a tap of running cold water, then drain again. 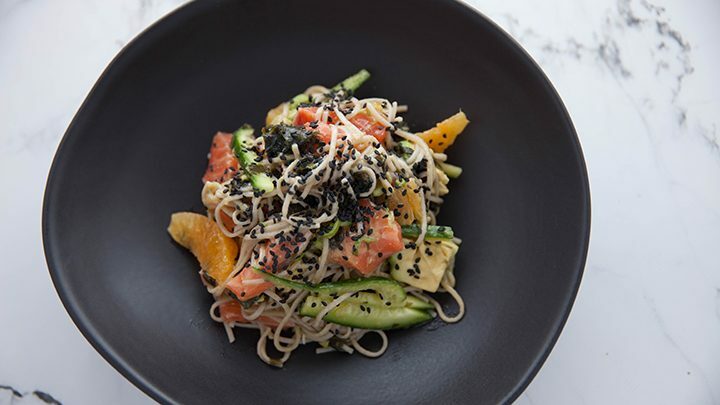 Combine the noodles with the salmon, avocado, orange segments, cucumber and spring onion in a large bowl. Drain the wakame (if using), roughly chop and add to the noodle salad. Pour on the dressing and toss well. Arrange the noodle salad on a platter and sprinkle with the sesame seeds.